Having read the recent “Cops off Campus” comment article in SCAN (Week 2), I feel it appropriate to provide you with my opinion as to my presence on campus and to let you know what I do. Firstly, it is important to note that I am not deployed to the University as a means of Big Brother watching over you. If I ever hold any interest in you, then you will know as I will come directly to speak to you. I would like to think that I am a fair officer in this aspect of policing, and I am always open with my intentions. I personally would also like to think that my style of policing is vastly different to that applied by other officers on other campuses. 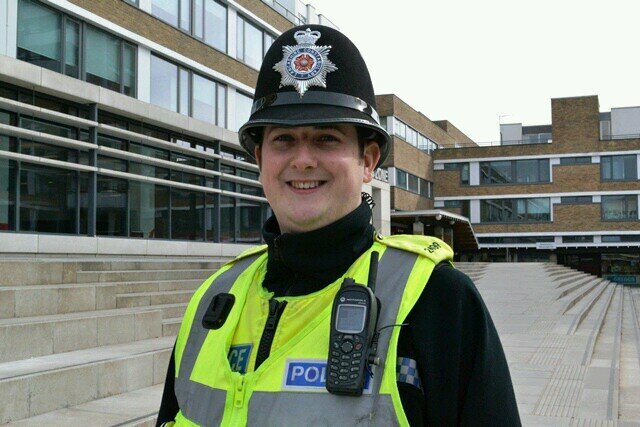 Over my three years on the Lancaster University campus, I have adapted how we, as Police service in Lancaster, work with the University, the Students’ Union and Lancashire Constabulary. Many of my colleagues are former students and they have also helped me shape the policing of the campus to Lancaster University’s unique needs. I am aware that before my arrival on campus there were issues surrounding police response to incidents. However, I feel it necessary to point out that I have adapted this vastly since my arrival. The police response to the occupation of University House, during which no police force was used unlike at Warwick University, is a particular example of this. Since my arrival I have worked hard along with the Campus Security team to make sure that the police response is both appropriate and necessary when dealing with incidents involving students. This has ensured that only a handful of arrests have needed to be made during my tenure as Campus Police Officer. In relation to what I do on campus; my primary role is to look at ways to improve student safety both on and off-campus. I therefore work closely with the University and Students’ Union on campaigns and initiatives, such as how we police the Big Nights Out each year, and also security marking of both property and bicycles. By doing initiatives such as this we have continually improved in our safety ratings each year. I will always strive to address welfare-based issues in a sensitive and appropriate manner, and I do not view my role as a punitive one. During my time on campus, I have worked hard through discussions with everyone to look at ways to keep students out of custody and utilise more appropriate means of dealing with student based issues (such as deanery action, for example). Through a combined effort, I there look to intrude on your student lives as little as possible whilst providing a low-key visible presence at larger events held both on and off-campus to ensure that any issues that arise are dealt with in a fair manner. This is shown time and time again with your able assistance in dealing with issues that arise, and incidents that have arisen on campus recently have shown that by working together we can all show a united front in dealing with those who try to spoil things for others by acts of anti social behaviour or criminality. In summary, I am dedicated to ensuring that your time at Lancaster University is a safe and enjoyable experience and those who target students or disrupt your peace are dealt with appropriately. Please also be aware that my role as Campus Police officer is only one portion of my policing role and I am not on campus 24/7. I also have the responsibility of looking after the residents in South Lancaster, and I am part of Lancashire Constabulary’s new Mental Health Response Service who deploy aid to those in a mental mealth crisis. Finally, one of the key issues I would like to raise is that Lancaster University is home to over 25,000 students and staff which essentially equates to a small town. The police would therefore be naïve if we were to show no form of presence whatsoever to support the University staff, businesses, and its students. This is something I feel should always be considered into any debate regarding no police presence on campus. Ultimately, would you really be happy in your own home town knowing that you have no point of contact when it comes to the police? I am sure that this debate will rumble on for many years but so long as I am asked to be your University Police Officer, I will give you the best service that I can.